Fully embedding technology into the curriculum is key to preparing students to meet the demands of the 21st century. The authors provide K–6 teachers with practical suggestions for incorporating technology into familiar literacy practices and illustrate ways technology can deepen students literacy development. Each chapter includes information about easy-to-use technology tools, examples from real classrooms, and step-by-step instructions to get started. Appraise how 21st century notions of literacy differ from traditional notions of literacy. Consider research that states why it is crucial to include digital tools in todays classrooms. Learn how to enable students to create, communicate, collaborate, share, reflect, and assess through digital means. Gain step-by-step instructions for incorporating easily implemented digital tools into classroom practices, and see these tools and practices in action through vignettes. Receive tips for adapting the suggested digital tools and instructional strategies to meet the needs of different content areas. Excited about all the technology tools to enhance literacy. 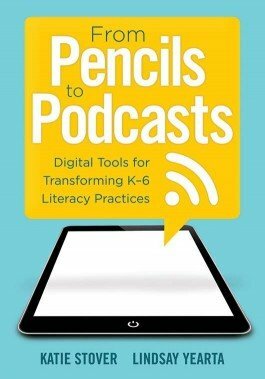 And super excited about the new book From Pencils to Podcasts! As someone who is super passionate about the use of digital tools to promote engaging, high-quality experiences with literature and informational text, I was excited to dive into this book.